As show season begins to wind down, you may be determining your goals for next year and how to work towards them. As you lay out your plan, consider crosstraining your horse in another discipline. Crosstraining has many benefits and can enhance the performance of both you and your horse. Crosstraining horses is a popular method to gain the benefits offered by a different discipline. Training western pleasure horses to jump can teach them to better balance themselves and use their hind ends. Jumpers may be trained in dressage to teach them to use their bodies effectively and to make them more aware of the rider's signals. Driving horses can also be trained under saddle to teach them to balance their bodies effectively and carry weight in a different fashion. There are many benefits to crosstraining. Each riding discipline uses and develops the horse's muscles in different ways; training in the beginning levels of a different discipline will change the way that those muscles are used, and can strengthen your horse's overall athletic ability. The same is true of the rider; in crosstraining you will learn different skills and different positions and movements in the saddle, making you a better all-around rider. Developing these lesser-used muscles results in enhanced athletic ability and can also lessen the chance of injury. Crosstraining also builds confidence and deepens the communication between horse and rider. 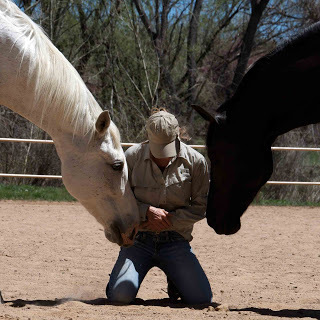 In tackling a new skill, you and your horse will face a challenge together. In working through the challenge with patience, you will both gain confidence in one another. Communication is also important in crosstraining, and a new discipline will enhance your current communication methods with your horse, while also developing new ones: as you use different leg positions and rein aids, your horse will learn the meanings of these, giving you added communication tools which you can put to use in your riding. As you train your horse in a new discipline, you will increase your horse's versatility and athletic ability. Participating in a new discipline will also increase your understanding of how your horse's body works. In addition, you'll give both yourself and your horse a mental break from the rigors of training in your current discipline. Not only will you become a more versatile horse and rider pair, but when you return to your main discipline, you may find that both you and your horse are refreshed, invigorated, and better able to tackle your riding goals.